Forecast for Thursday and Friday across Colorado remains mostly on track with our update yesterday. 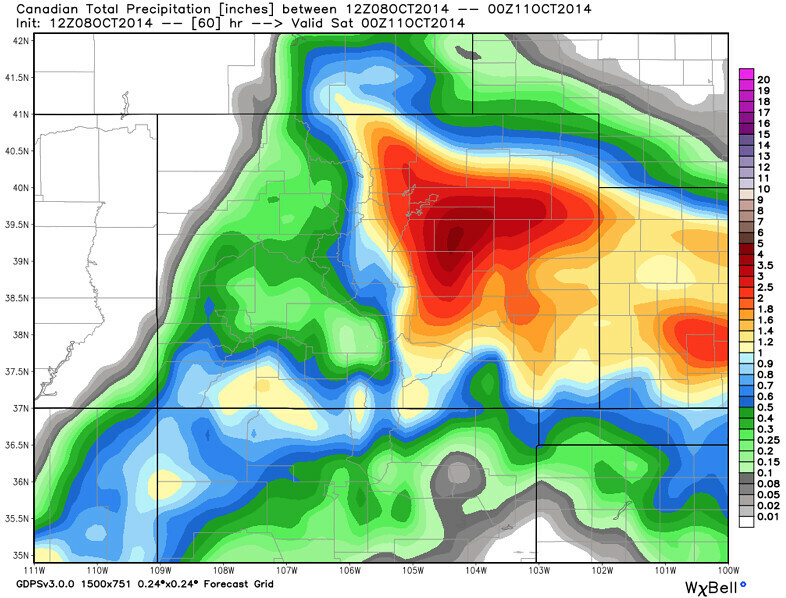 Models have come into better agreement over the last 24 hours, and continue to bring a large swath of heavy rain to portions of central and eastern Colorado. Rainfall totals from 0.5 to 2.5+ inches will be possible with this system depending on where you are. We’ll start to feel the effects of the approaching system overnight tonight with scattered rain showers developing Thursday morning, increasing in coverage through the afternoon. Yesterday we outlined areas from I-70 south along the Front Range as having the greatest chance for the higher rainfall totals through Friday, this continues to be the case. That said, a few of the models have trended a bit further north with the heaviest rainfall today, which has increased confidence in rain for Denver, especially the southern and southwestern suburbs. The Palmer Ridge will likely be the winner when it comes to rainfall totals, with models producing anywhere from 1 to 4 inches QPF through 00z Saturday. While this system will be less prone for flash flooding, any localized heavier rain and embedded storms will certainly be cause for concern -- stay weather aware! 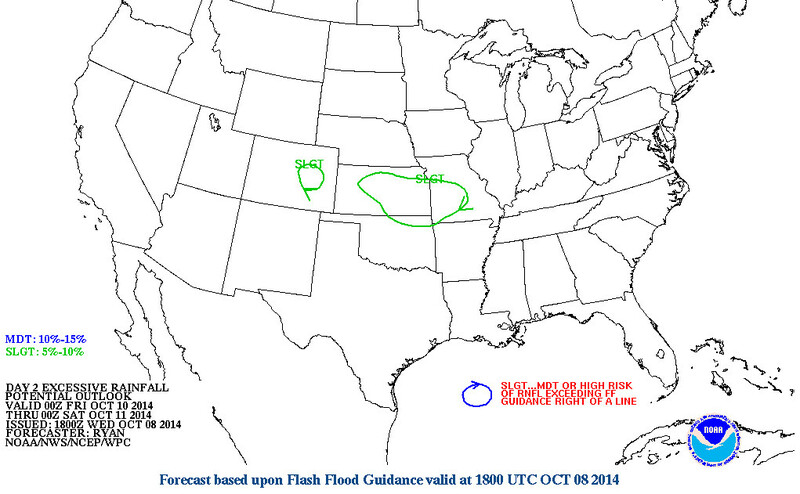 Here’s the outlook from the WPC for excessive rainfall over the next two days. They’re pretty close to our thinking with the greatest risk area being east-central Colorado. This system will not be all that cold (at least by October standards) but we’ll certainly feel the chill after several days with highs near 80 to start the week. Thursday’s temperatures will be some 20 degrees cooler than where we were today, with highs in the 50s Friday. Overnight lows should stay in the 40s at lower elevations over the next couple of nights -- but couple that with rain Thursday night and it won’t feel pleasant. Snow will be possible overnight Thursday in the mountains, with models off and on producing a few inches at higher elevations. We should see a better chance for mountain snowfall with a colder system due to arrive Sunday across the region. I’ll wrap things up with two model images. The first from the Canadian model for total precipitation (inches) through 00z Saturday. It’s likely a bit overzealous in places, but gives a nice picture of the widespread rainfall event we are expecting over the eastern half of the state. The second is the probability of rainfall totals of 0.25 inches or greater between forecast hour 36 and 48 from the SREF. 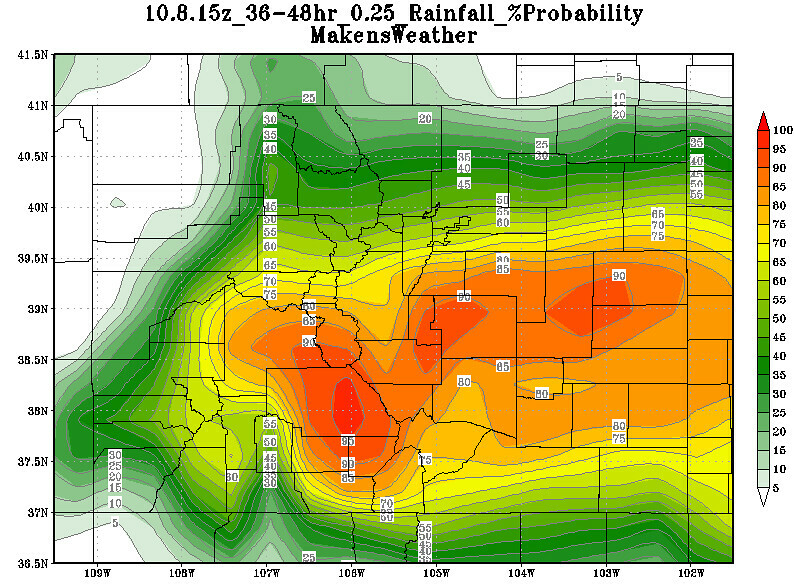 It shows highest probabilities of receiving that amount south of Denver, hugging the Palmer Ridge area. Stay tuned, and stay dry!